Kitchenaid kettles are made for stylish kitchens. Iconic design combines with the best technology for a kettle range that delivers functionality as well as looks. 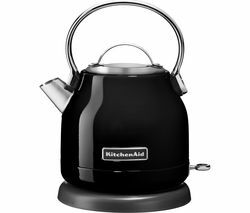 Our Kitchanaid kettle range features tall and slim classic jug kettle designs, as well as the now iconic Artisan model. Tying in neatly with the full Artisan range of kitchenware, its vintage looks are ideal for retro lovers. From 1.5 to 1.7 litres, Kitchenaid kettles come in a range of colours – empire red, almond cream, onyx black and silver – to complement every kitchen. With their dual wall construction, they guarantee a quick and quiet boil. 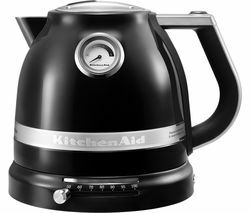 Kitchenaid kettles feature innovative temperature control settings, which allow you to boil water from 50°C to 100°C. This ensures the perfect brewing temperature for more delicate herbal teas as well as specialist coffees. A temperature gauge allows you to see the temperature of water inside the kettle, even when the kettle is off the base. A 360° base, and cordless kettle design, make for ease of use, while a soft touch handle makes use a pleasure. Stylish and functional, our Kitchenaid kettles are at home in any kitchen. For a wider range of kettle designs, sizes and colours, check out our Delonghi kettles and our Morphy Richards kettles too.